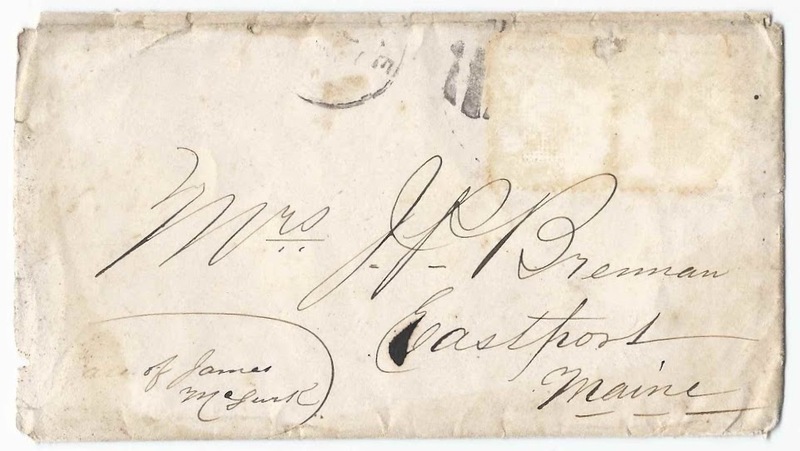 c1866-1871 letter from John P. Brennan, then at Madison, Indiana, to his wife Georgiana (McGurk) Brennan at home at Eastport, Maine. 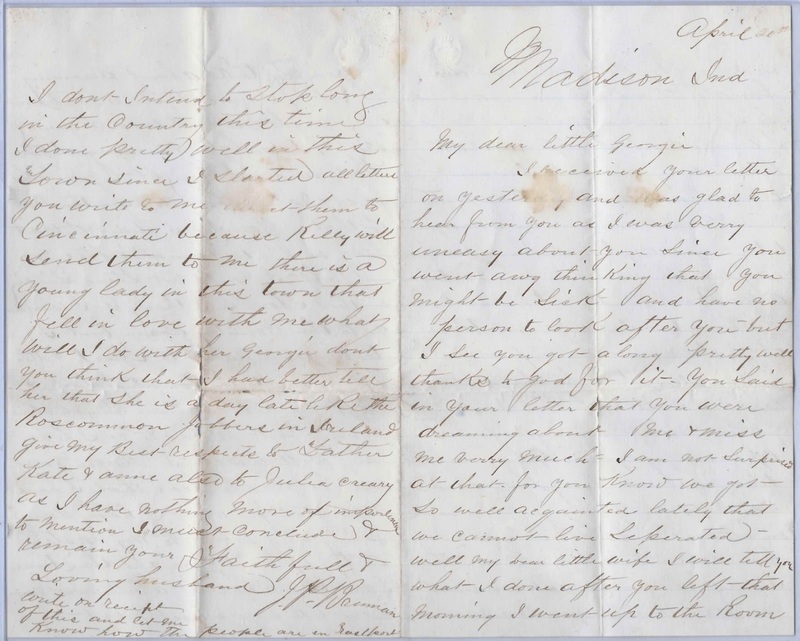 From Maine Marriages 1771-1907: John P. Brennan and Georgiana McGurk married at Eastport, Maine, on 2 August 1866. From a Find-a-Grave listing: Georgiana Brennan died on 9 September 1871 and is buried at Hillside Cemetery at Eastport, Maine, age 32. 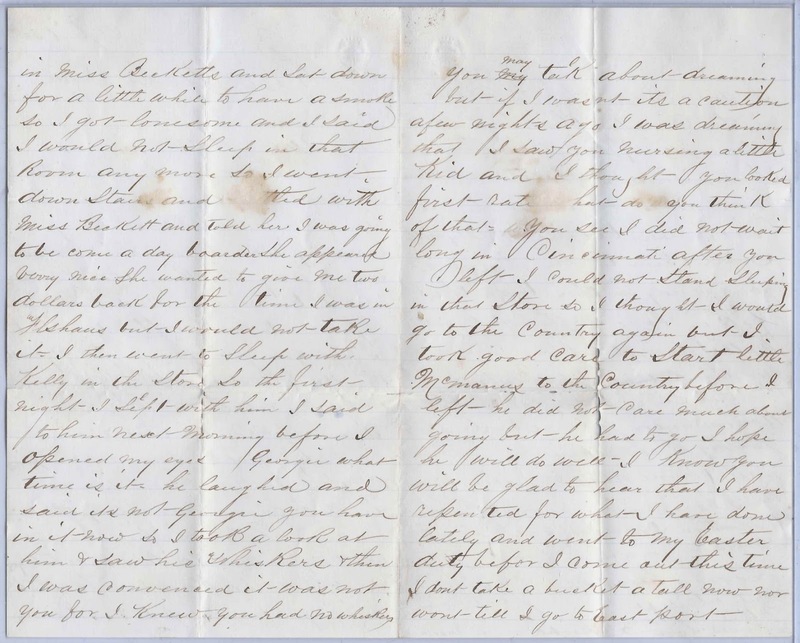 Since John referred to himself as a "Faithfull and Loving husband", it would appear that the letter was written after August 1866 and no later than it would have taken John to hear of his wife's death in 1871, if they were still apart. I received your letter on yesterday, and was glad to hear from you as I was very uneasy about you since you went away thinking you might be sick and have no person to look after you but I see you got along pretty well, thanks to God for it. 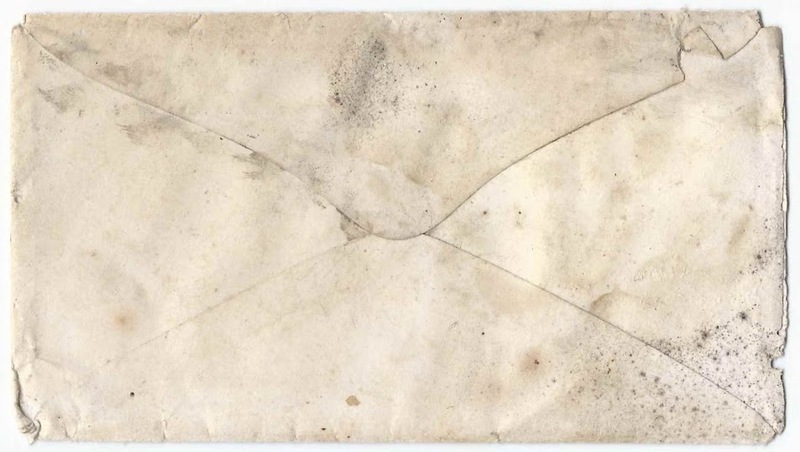 You said in your letter that you were dreaming about me and miss me very much. I am not surprised at that for you know we got so well acquainted lately that we cannot live separated. Well, my dear little wife, I will tell you what I done after you left - that morning I went up to the room in Miss Becketts and sat down for a little while to have a smoke. So I got lonesome and I said I would not sleep in that room any more so I went down stairs and settled with Miss Beckett and told her I was going to become a day boarder. She appeared very nice. She wanted to give me two dollars back for the time I was in [Flshans?] but I would not take it. I then went to sleep with Kelly in the store. So the first night I slept with him I said to him next morning before I opened my eyes, "Georgie, what time is it?" He laughed and said "it's not Georgie you have in it now", so I took a look at him and saw his whiskers, then I was convinced it was not you for I knew you had no whiskers. You may talk about dreaming but - if I wasn't - it's a caution. A few nights ago I was dreaming that I saw you nursing a little kid and I thought you looked first-rate. What do you think of that? You see I did not wait long in Cincinnati after you left. I could not stand sleeping in that store so I thought I would go to the Country again but I took good care to start little McManus to the Country before I left. He did not care much about going, but he had to go. I hope he will do well. I know you will be glad to hear that I have repented for what I have done lately and went to my Easter duty before I came out this time. I don't take a bucket atall now - nor won't till I go to Eastport. Write on receipt of this and let me know how the people are in Eastport. Georgiana McGurk was born in New Brunswick, Canada, about 1849, the daughter of James McGurk, an immigrant from Ireland; the family name is likely a variant of McGuirk. I don't have the name of Georgiana's mother. Buried with Georgie at Hillside Cemetery at Eastport, Maine, are her father and her sisters Catherine (McGurk) Sinnott and Mary J. (McGurk) Muldoon. There's also a John Patrick Brennan buried at Hillside Cemetery at Eastport, Maine. His gravestone shows a death date of 29 April 1879. I don't know if this is the grave of the letter writer John P. Brennan or his and Georgiana's son John P. Brennan, who was born about 1869 and who was shown living with Georgiana in the 1870 Census of Eastport, Maine.